This story was updated at 3:50 p.m. EST. The space shuttle Atlantis cast off from the InternationalSpace Station early Wednesday after almost a week linked to deliver vital spareparts. The shuttle detached from the orbiting laboratory at 4:53a.m. 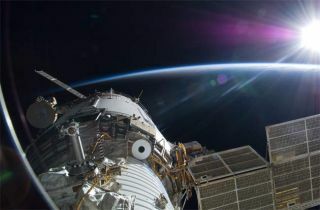 EST (0953 GMT), and flew in a circle around the station so that astronautson the orbiter could snap detailed photographs to check on the state of theoutpost. "It?s a pretty exciting thing to do, be able to see thestation you were living in again now on thefarewell," STS-129 commander Charlie Hobaugh said in a preflightinterview. "Just having it gives us a new snapshot in time of thecondition of the vehicle at that point." Atlantis' pilot Barry "Butch" Wilmore, afirst-time spaceflyer, helmed the ship for the station fly-around. "It?s a good day for the pilot the way we plan ?emout," Wilmore said in a NASA interview. "We?ll do a burn that willput us initially on a trajectory to leave station and start on our way home. Soas I will do that burn going home, going home to my wife, Deanna, and our twogirls, that?ll be a neat time." Atlantis is slated to land Friday at 9:44 a.m. EST (1444GMT) at NASA's Kennedy Space Center in Cape Canaveral, Fla. The astronauts spent Wednesday conducting a final scan oftheir shuttle's sensitive heat shield to make sure it is intact and safe forre-entry. They used a sensor-tipped boom attached to their shuttle's roboticarm to pore over the tiles, and preliminary data indicates that there are nomajor issues to worry about. NASA is looking into a problem that arose today with theshuttle Atlantis' waste water tank, which is full of about 165 pounds of urineproduced over Atlantis' week-long stay at the space station. When the crewtried to empty the tank this morning, the nozzle was blocked and only emptied partway. Ground crews are looking into the issue, but lead shuttleflight director Mike Sarafin said it was "not a showstopper." "We know that we can make it through landing daywithout having any problems," he said. "It's only if we extend pastthe planned landing day on Friday that we may have to take additional measures." Onboard the shuttle with Hobaughand Wilmore are mission specialists Leland Melvin, Randy Bresnik, MikeForeman, Robert "Bobby" Satcher, Jr, and Nicole Stott. Stott onlyrecently joined the Atlantis crew. She has spent the last three months on theInternational Space Station as an Expedition 21 flight engineer. After an extended time in space, Stott said she is eager tobe back on the ground. "I think the two main things are seeing my young sonand my husband," she said Tuesday before boarding Atlantis. "I thinkjust getting back out in the sunshine and just being back with family andfriends is the main thing." Bresnik is also excited to return to Earth so that he canmeet his new daughter, babyAbigail, who was born to Bresnik's wife while the astronaut was in space. The STS-129 crew is leaving a re-stockedspace station. Atlantis delivered about 15 tons of spare supplies to lastthe station beyond the point when shuttles retire and only Russian Soyuzspacecraft and unmanned cargo ships service the outpost. The spaceflyers are leaving five people on the spacestation, now commanded by NASA astronaut Jeff Williams, who took the helmTuesday during a change-of-command ceremony.